A large, whimsical flower pillow and matching rug are sure to be fun conversation pieces wherever they are displayed in your home. 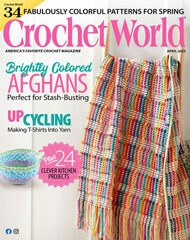 This e-pattern was originally published in Easy, No-Sew Crochet. Size: Rug: 45" diameter. Pillow: 26" diameter. Made with bulky (chunky) weight yarn and size K (6.5mm) hook.